I don't know how I managed following lace charts without my new magnetic board. You put it behind the chart and hold it in place with magnetic strips and a magnetic ruler marks which row you're on - it makes all those little sticky post-its unnecessary. 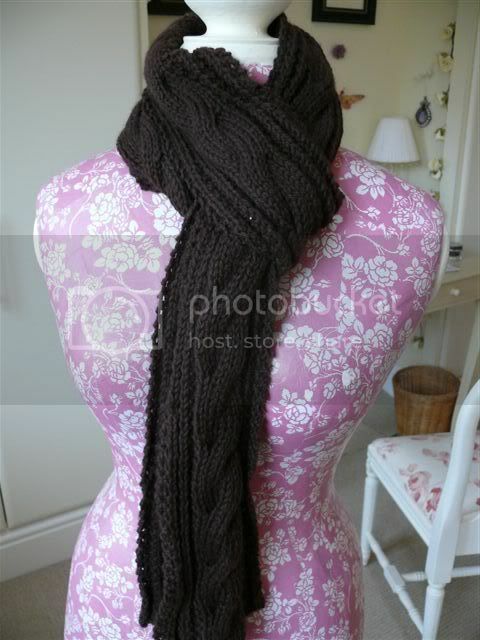 I found it here at Peachey Ethknits and they were really efficient - I ordered it one day and it arrived the next. Click on "Accessories" and then select "Loran Needlework Accessories". I've joined a new (to me) sock yarn club, the Yarn Yard club, where you only sign up for 3 months at a time so it's not too much of an initial outlay. It's quite nice to have the colour decision taken away because so often choosing from the pc screen what I think is the perfect colour, turns out to be not quite what I wanted. This way you just use whatever you get - a bit like Ready Steady Cook. 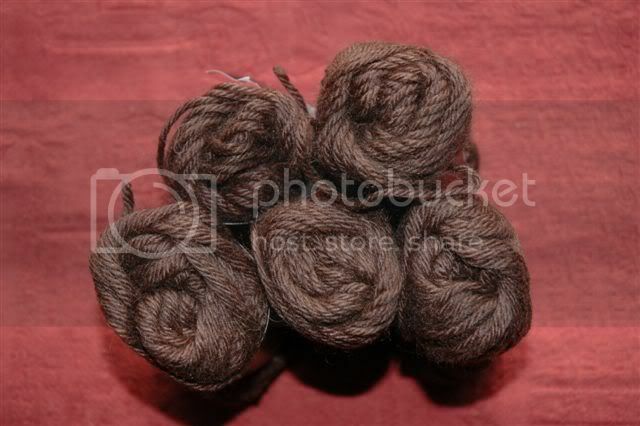 And you get the main yarn plus a smaller amount of extra yarn to go with it to knit different coloured heels and toes. Look at how nice they are! Thank you Dipsy, I love them. This is some 70% Baby Alpaca / 30% Cashmere in a really dark chocolatey brown that I found on Ebay from Turkey and I used it to make this scarf from Pam Allen's "Scarf Style"
It has a rib and cable pattern that is the same on the front and back - I think if you click on the photo you will be able to see this. Wow, you've been one busy knitter. Beautiful projects! Wow, you've been so productive lately, I'm totally impressed! 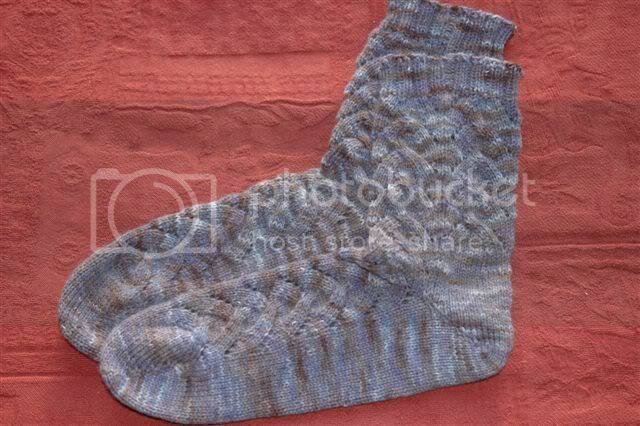 Your New Year's Day socks look so fantastic, the yarn that you were using makes the pattern really "jump out", so to say - they look amazing! And so does the scarf, it seems to be so soft and cozy and warm - just perfect! 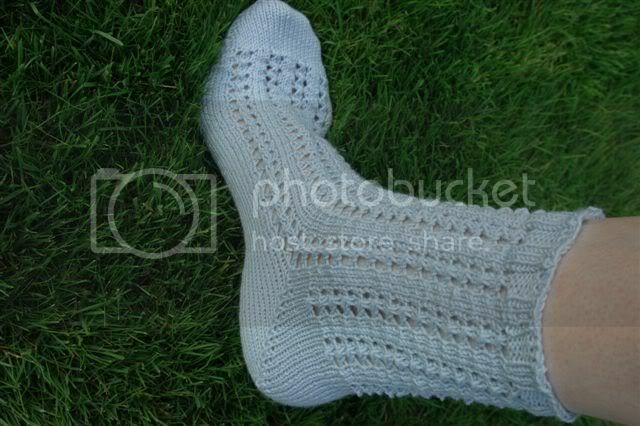 A big thank you also for sharing the pattern for your lacey socks, I will definitely try my hands at them very soon as this is such a lovely and gorgeous pattern! Thanks for taking the time to write it out for us! Wow! You have been busy. I love the scarf - pattern and colour. And the socks are lovely. Your pattern is nice and easy to follow too. I love those socks!!!! I think eyelets are so pretty in socks. You've gone lace crazy!! It all looks so good.